The Funeral Cortege for Mrs Julie (Esme) Krisohos of Opal Aged Care Armadale formerly Hamilton Hill will arrive at FREMANTLE Cemetery, Carrington Street, Palmyra at 10:30am on TUESDAY (30.04.2019) for a Cremation Service in the East Chapel. Please assemble at the Carrington Pavilion at 10.20am. 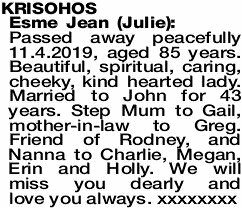 Heartfelt sympathy to John, Gail and Rodney on the loss of their dear wife and mother who died peacefully. Julie is remembered with joyful memories which will continue to fill the hearts of her Good Shepherd family. May she rest in God's loving care. Our deepest sympathy to John and Gail and family. Julie was a lovely lady and friend for many years.